Wow it's been a fast week! I didn't get to posting Dorie's chocolate chip cookies but they were a big, delicious mess. I know you all think everything I make is perfectly delicious, served up on time, right? Haha! Really though we've been busy working on the house. My baby strawberry turned five months this week, which is crazy fast, and her nursery is almost done. We found an awesome old bedroom set, that was very ugly but had lots of potential, and are painting it now. My mom finished her gorgeous bedding and I'm super excited to finish it up. I've finally hung some curtains in our bedroom and worked on getting pictures on our bare walls. It's also been beautiful outside (60s and 70s, sunny but not at all hot) and so we've been making the most of our limited spring time here in sunny AZ. 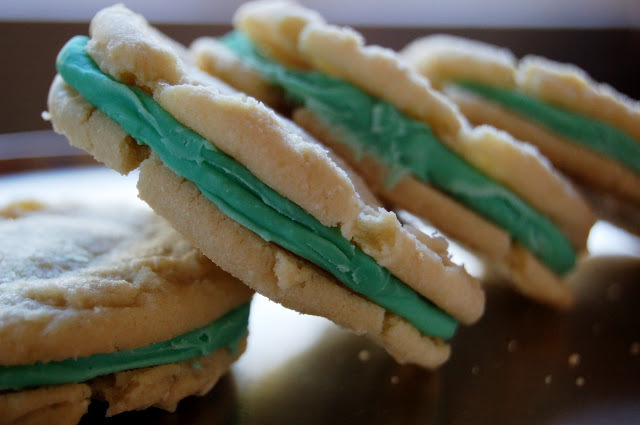 In honor of the beautiful weather I have one of my favorite cookies in a spring version- a soft, chewy vanilla cookie sandwiches a mint ganache made with my favorite (and shockingly green) mint chips from Guittard. I found them online here but don't know anything about that retailer. I know I can find them at Safeway here (especially around the holidays) and at Ream's and Macys in Utah. They're crazy delicious and worth hunting down if you love mint like I do. You could also sub in chocolate or make Martha's original raspberry version which is also delicious.You really can't go wrong with these cookies- I've even made a blueberry filling before. Let me know if you try any fun flavors. For the record I used butterscotch chips once and everyone said they were too sweet, but I know some people say there's no such thing! I'm also happy to announce that Melody won the Safeway card from last week's giveaway. Get me your address and I'll have it sent right out! Preheat oven to 350 degrees. Whisk together flour, baking soda, and salt; set aside. Mix butter and 1 1/2 cups sugar with an electric mixer on medium-high speed until pale and fluffy, 2 to 3 minutes. Add egg, extract, and vanilla seeds; mix until smooth. Reduce speed to low. Gradually mix in flour mixture. Scoop batter using a 1-inch ice cream scoop; space 2 inches apart on baking sheets lined with parchment paper. Bake cookies 4 minutes. 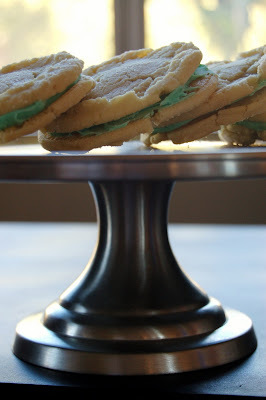 Remove from oven; gently tap baking sheets on counter to flatten cookies. Return to oven, switching positions of sheets; bake until cookies are just set, 4 to 6 minutes more. Let cool on parchment on wire racks. Melt mint chips in a heatproof bowl set over a pan of simmering water. Remove from heat; whisk in cream in a slow stream. Refrigerate 30 minutes. Great idea for St. Patrick's Day treats! It's amazing how fast our babies grow! My baby is 27 and it seems like yesterday she was still crawling. Love your cookies! Yum I am pretty sure these little cookies are going to be the death of me. They look soooo good! Mmmmmm! I love mint. Looks good!